Its nearing years end and Christmas Eve is the day of the year where my annual interview with Orcs in the Webbe is published as the end of a month of excellent free articles. 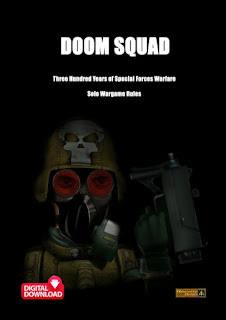 Articles written by dedicated wargamers and hobbyists, creators, game designers and more. I have had a couple of scenarios in this years advent as is my due as the man behind Flintloque. 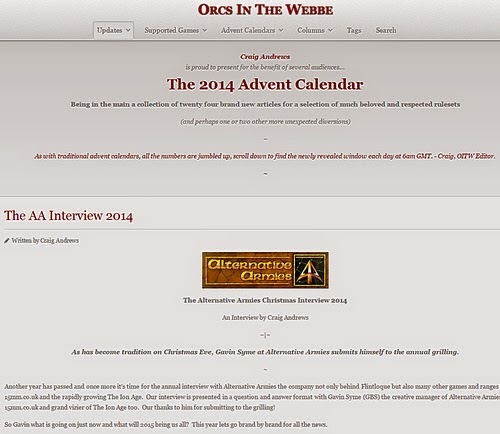 You can see these scenarios in the listing of days for Advent 2014 on Orcs in the Webbe. Go to The Annual Interview 2014. My annual interview with Craig Andrews takes a look at the year now done and forward a year to this point in the coming orbit around the sun. It has grown over a decade in size and also in scope and this year topping the scales at over four thousand words it looks at the following. Alternative Armies goals for 2015 and the development of the Von Rotte Legion and more. 15mm.co.uk moving into more 15mm fantasy in a big way and working with Loud Ninja Games. The Ion Age and its doubling in size, the Planetary Militia, the Zin and its ambition to do something with 15mm science fiction that no other brand ever has. There is a lot more than that to read of course including what I do in my spare time and news on Bedlum as well. Enjoy the read. For you see I am Flintloque but I am also the fellow who runs 15mm.co.uk and created the rapidly evolving The Ion Age too. There may be others like me out there in the world of miniature wargaming who have so many hats...but not many. If you want to chat with me then drop us an email and ask your wargaming questions. I would love to hear from you all. From everyone here at Alternative Armies we wish you a Merry Christmas and a Happy Hogmanay too! Thanks. I enjoyed writing it Rob. Christian's miniatures are at master mold stage so look for them in a month or so. You have a great one too. I really liked the Barkhoven figure, though I confess I've still not painted mine. Thanks for your comment Dave. Try harder and you will succeed I am sure. Barkhoven was a really popular chap in 2014. The temptation was toooo much and I have ordered the new Dwarves. I saw that this morning Tony. Excellent choice. Your order plus all the others with the Von Rotte Command on special pre-order will be coming out the very first day into the new year that the mail service begins again. You will have them before or at the same time as release! I will pass your regards onto the whole team and thanks again.